In December last year, US President Donald Trump raised some eyebrows when he signed the 2018 Farm Bill — a bill including the Hemp Farming Act of 2018, which sees hemp officially removed from the Controlled Substances Act. In short, this means that hemp can now be regulated as an agricultural crop, representing a major win for hemp growers and hemp CBD companies (CBD stands for cannabidiol — you can learn how CBD interacts with the body here). The bill has been fully passed and enacted into law, removing any federal regulations preventing companies from growing, marketing and selling hemp. It’s a significant milestone that will make it easier for companies to access federally regulated services like insurance or access to capital, as well as access to utilities like water — a key concern when growing hemp. This would seem like a predictable move, as part and parcel of Trump’s broader deregulation agenda, except for the fact that the legal status of cannabis is still a controversial topic in the Republican Party — despite the fact that both medical and recreational marijuana usage is now legal in multiple US states. The US President’s attitude towards legalising marijuana could make him an unlikely champion for the cause. Given the overwhelming popular support for the change, he may be eyeing the opportunity to improve his chances of reelection in 2020. 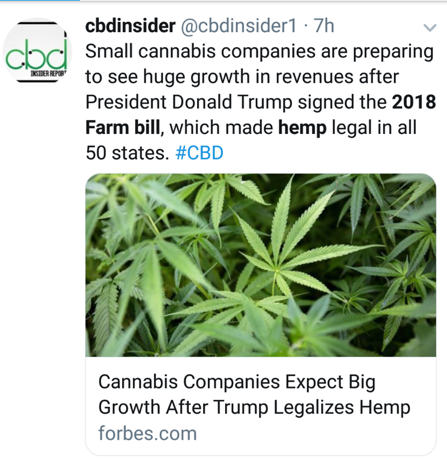 Whatever Trump’s reasons for signing off on the bill, there are plenty of companies and investors who now stand to benefit, and this could well precipitate a further boost to the burgeoning cannabis and hemp markets. 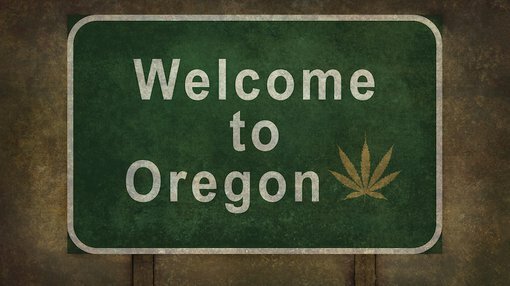 Meanwhile, ASX ag-tech junior, CropLogic (ASX:CLI), has had its eye on the Oregon hemp market for some months now. CLI is an award-winning, New Zealand-born ag-tech company which offers farmers and growers of irrigated crops the latest in science, agronomy and technology through its key software, CropLogic realTime. In November, CLI announced it was looking closely at opportunities within the Oregon industrial hemp market (which is the third largest in the US), and had appointed two consultants to help: corporate advisor Green Rush Advisory Group and law firm Green Light Law Group. CLI launched its CropLogic realTime product offering into Washington State last year, and the small cap services a significant number of horticultural growers in the region — holding up to 30% market share in some crops. The ag-tech junior believes it is well-placed to take advantage of the emerging agronomy and digital agricultural trends in hemp and CBD production, and currently sees Oregon as the place to be. Today, the company revealed it has received a significant report as part of its engagement with Green Rush Advisory Group. That report includes details relating to the current trends and demand for hemp and CBD products, licensing and growers, the addressable market, and the future potential of this market for CLI. The report compares the market and growth drivers for industrial hemp with that of the medical and recreational marijuana industries, noting that industrial hemp growth is due to the “relatively low cost of engagement, comparatively lower owner and investor risk regarding hemp production, continual research and confirmed benefits of CBD products which can be manufactured using industrial hemp, as well as scalability advantage with there being no limit on the scale of hemp production in Oregon”. Furthermore, the report has provided CLI with insight into which licence type it would require for industrial hemp — grower, handler or agricultural hemp seed registration — with the company determining it would seek to obtain the grower license. Oregon currently has 576 registered industrial hemp grower registrations, which represents a 4369% increase since licencing began in 2015. Moreover, the acreage used for industrial hemp has grown 960% to 11,000 acres. The company compares the rate of growth to that of the hops market in Washington, which CLI is already servicing. The report also identifies three potential ways forward for CLI, with Green Rush recommending that the small cap either start a new hemp business, buy an existing hemp business or create a stakeholder engagement campaign in order to develop prospective collaborations with hemp licensees. However, before the company makes the final decision, it will wait to receive the advisory report from Green Light Law Group. Oregon hemp market set to explode? With the 2018 Farm Bill now enacted into law, these times could prove prosperous for CLI and any company with an interest in the US hemp growing market. It’s a convergence of events that could see hemp growers begin to crop up (so to speak) all over the place. With the effects of rising carbon emissions — and with them, the earth’s temperature — growers of irrigated crops are going to need help managing water resources, among other things. An article in Oregon Business from October last year describes the Oregon hemp industry as “like a raging river, restrained by a dam that might soon break and allow products to flood an array of new markets”, citing the 2018 Farm Bill as a potential (at the time, future) turning point. Forbes highlighted the news in an article published December 30, although with the US government shutdown beginning on December 22, the weight of the event got lost amid the furore. However, Twitter users have begun to pick up on the news in the last few 24 hours with an influx of tweets on the topic. A promising point to note for CLI — and other hemp/cannabis-related small caps on the ASX — is that the decision by the US President is sure to be looked at closely by other countries, including Australia, which would not want to fall too far behind in the burgeoning field of medicinal cannabis and hemp products. According to the Brightfield Group report (2018), hemp CBD sales in the US are forecast to grow from US$174 million in 2016 to US$22 billion by 2022. If the prediction is right, it would represent a runaway CAGR of 138%. Are small caps an option in the upcoming bear market?